You are here: Home / Classic / First Right Hand Drive Production Jaguar E-Type Driven To The Max? 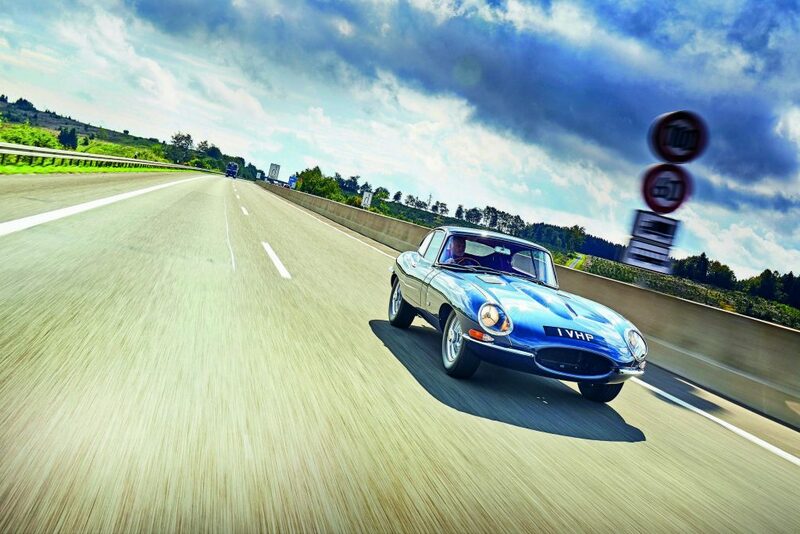 First Right Hand Drive Production Jaguar E-Type Driven To The Max? 1961 Jaguar E-Type chassis 860001, the very first right-hand-drive production Fixed Head Coupé restored by Classic Motor Cars Ltd (CMC), has been driven to 146 mph on a German autobahn by British Hill Climb Champion, David Franklin. David was recreating for Octane magazine’s 150th issue one of the most famous road tests ever undertaken, attempting to match the 150 mph a Jaguar E-Type reached on a Belgian motorway in 1961, and he nearly made it! In 1961, Autocar took E-Type 9600HP to Belgium for a high speed test, looking to assess Jaguar’s claim that a standard roadgoing E-type could achieve 150mph. This claim was validated in the historic road test, and Octane ventured to recreate the event using a similar car, E-Type 1VHP, chassis 860001. The car was restored in the early 2000s by CMC, one of the world’s leading restoration companies, and is regularly serviced and prepared by the company. For this occasion, the team at CMC went through the car with a fine attention to detail, fitting new wheels and Avon CR6 ZZ tyres and checking every mechanical element. The car’s engine was even dyno-tested on a rolling road and a higher capacity fuel pump was installed as well.